Are you into recycling but are still throwing away some food scraps because you can’t put them in your compost bin or worm farm? Large amounts of citrus and onions, or any food that contains fish and meat should not be put in your worm farms. Likewise, your compost bin is not meant to be used for dairy products and baked products such as cakes, bread, pasta, as these will attract pests such as rats and mice. Even worse are food scraps such as meat, fish, bones, grease and fat, as these can end up smelling rather unpleasant as well as attracting unwelcome pests! What if you simply don’t have space for a compost bin or worm farm, or want to process your food waste indoors? 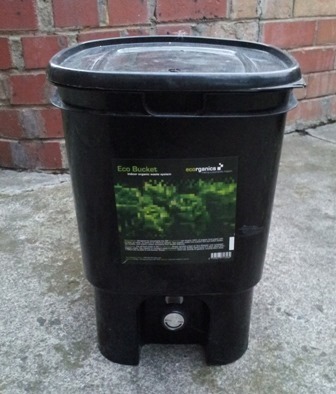 See the full article here to learn about the Bokashi composting system. This entry was posted in Gardening Information, What's New! and tagged bokashi, bokashi composting, Effective Microorganisms Bokashi, EM Bokashi, recycling food waste, waste fermentation. Bookmark the permalink. How about pet/human (humanure) waste? Use vermicomposting (worm farms) for pet poo, they’re actually recommended for the purpose. Be aware that worming medication for pets kills all worms, so don’t put pet poo in the worm farm after they’re medicated. There are even specifically built worm tunnels (worm farms that are partially sunken into the garden beds) that are for pet poo. For humanure use a composting toilet! Hi Angelo, thanks for writing this. We gave our apartment dwelling daughter a Bokashi, and she gives the bucket back to us when full, as she has no garden. I have read a little on Bokashi and it is generally agreed that it does not smell offensive, just ‘pickled’. I do find it offensive – and pervasive. The smell reminds me of rotting grass clippings, and it lingers on the bucket, and in the air even after the compost is buried and the bucket cleaned. Is this because we haven’t left the full bucket for a week to finish the process? Could it be just too wet? It doesn’t sound right, the bokashi bucket shouldn’t smell unpleasant. If the liquid is not drained, and there has to be a LOT of liquid, and I mean a real lot, it makes the mix waterlogged and it then goes putrid. I only drain the liquid once when its all complete but I don’t put overly wet materials in there. Also make sure that the container isn’t located in full sun when in use as this will heat the air inside and force some out. Using the newspaper lining means there is less material stuck to the inside to wash, which makes cleaning easier. To wash the container out, I place it on the lawn and half fill the container, swirl it round a few times, then pour the water in the garden or on the lawn. I do this twice. Then I place the container sideways on the lawn, put the plastic grill and the lid bedside it and wash them thoroughly using a jet off moderate pressure water using a hose with a trigger nozzle to remove anything material stuck to the container and its parts. I usually stand some distance away so I don’t get splashed with the water. To dry everything I prop up the container upside down to drain, leaning it at an angle against a wall, alongside the gill and lid, and air them for the afternoon in the sun. If you wash and air the container well, it won’t have any smell on the outside. Every now and then when if things don’t clean well I gently scrub with a soft nylon kitchen brush. Thanks Angelo, I am guessing it might be too wet then. With regards to putting bones in there, how long do they take to break down once in the soil, I’m worried a dog will dig up chicken bones and eat them. I’m not sure how long bones take to break down after they’re fermented, as I’ve never dug them up afterwards to check! I suspect the acidic conditions will help them break down faster and release more nutrients from them. If there is a risk of your dog digging them up (not sure if dogs are repelled by the fermentation smell) you can always dig a deeper hole, or place some deterrent over the area such as wire mesh to discourage digging, it depends on how big the dog is really. I have a few bokashi buckets, and love them. They complement my tumbler compost barrel and my big compost bays and my worm farms. I aim to put most organic material back into the ground. However, one thing I will never put in any of these is a bone, because it’s so likely it will somehow end up in a dog’s mouth. I put all bones into my council garbage bin. Even then I’m amazed at how often my dog grabs a bone from the nature strip, where it has fallen out of a kerbside bin. Some people incinerate bones instead, then crush them up into bone meal and sprinkle it in the garden as a source of calcium and phosphorus. Hi Angelo. Thanks for these detailed instructions. I am keen to give this a try for fruit and vegetable scraps that I can’t put in my worm farm, but which I don’t like to put on my open, cold compost heaps for fear they will attract vermin. 1. do the materials for the bokashi bin need to be chopped up into smaller pieces, as for a worm farm or compost heap, or can they go in whole (eg citrus halves)? 2. should the materials for the bokashi be “fresh”, or could I put in scraps that have already started to rot? I generally put most of my kitchen scraps in a dedicated bin outside, then sort them from there every week or so into the compost, worm farm etc. Sometimes they start to rot before I have sorted them, though. 3. you mention in your reply to one of the other posters not to put the bokashi system in the sun. Are there any other relevant consideration in placing it outside? Is any shady spot outside OK? (I am located in Melbourne). I would be grateful for any further advice you have. I’ve use whole citrus in my bokashi mine, so halved citrus should work a bit better as it helps to expose a larger surface area for the microorganisms to work on and they don’t have to get through the peel first. There is no real need to chop things up, most things I put in by bokashi bin go in as they are straight from the kitchen. You’re not meant to put rotting or mouldy food in a bokashi bin because your bokashi system is really an environment for beneficial microorganism and if you add nasty bacteria and moulds from rotting food you’ll contaminate the system and it can go foul. The fermenting waste should be covered with what looks like a clean while mould, if there’s blue mould growing in there, most instructions recommend dumping it all and starting again, but I’ve found that by adding more bokashi mix over the blue mould, the good microorganisms outnumber them and take over. Bokashi systems are fermentation systems and work fastest at room temperature, if you put them outside in the cold the process will slow down. Try to aim for moderate conditions, not too hot or cold and you’ll be fine. I have used a bokashi bin in the past but you need the brand to add to layers of food waste. I have recently purchased a Hot bin here in the UK. This bin should retain a 30 to 40 degrees temperature C so most of the waste cooks and rot down and reduced in size very quickly. I put every thing in it including meat, then I add green vegetation that heats it up very quickly I add light layer of leaves or shreaded papar on top. In the winter you are suposr to add a plastic bottle with hot water in it to keep the temprature up.